Rubberstamp.io (now called ProcurementExpress.com) is a finance and accounting app that provides an instant view of the budget and the ability to sign off on purchase orders right away, even while on the road. It is mobile-friendly so that you don’t even have to login or remember a password. You can approve POs right from your inbox. Rubberstamp.io allows your team to get approval for purchases right away, rather than waiting several days for the manager to be back in the office. Your accounting team gets an accurate and complete record of purchases. The data can be downloaded at any time, and is compatible with your accounting software. The vendor offers a 14-day free trial. Rubberstamp.io is a user-friendly and time-saving way to manage purchase orders. Managers can easily approve POs and get an instant view of the budget, even while on the road. Finance departments get an accurate and paperless PO tracking system. You can use the app to control your company spending. You can customize purchase orders. The app is multi-location, so your entire team can access from anywhere, anytime, real time. You don’t need any training to set up the app, which takes just minutes. The app offers better supplier management, spend management and approval routing. Rubberstamp.io is versatile and is used by companies in facilities management, construction, charities, event management and more. Rubberstamp.io is powerful, yet simple to use. Its world class on-boarding team offers a free demo and will help you import all your data and customize POs so you can achieve spend control faster. 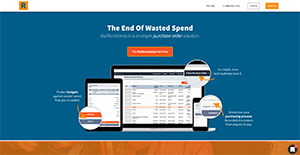 Rubberstamp puts you in control with easy and instant purchase order approval with live views of spending within budgets, projects, and departments. You can enhance your PO functionality with features like approval routing, custom fields, currencies and more. What Problems Will Rubberstamp.io Solve? Companies that manage projects often find it challenging to keep spending within budgets. Rubberstamp helps you to achieve spending transparency by allowing you to track spending on different levels. Total control is thus achieved because you can view the current totals of departments, projects, and budgets before you approve, reject or comment on purchase orders. To combat company fraud, total spend transparency is a must. Rubberstamp can help you achieve this by giving you control of every purchase within your company. You can set up different approvers for selected departments and even select multiple approvers per PO. With all evidence of spend in the cloud, you can access your PO system from anywhere, anytime. If you have worked with Excel or a paper-based purchase order system before, you will know that it can be a tad unreliable. With Rubberstamp, you can avoid scenarios such as lost purchase orders, because everything is stored in the cloud. With the option of multiple approvers, POs can be double and triple checked along the approval routing to correct any errors. Since each company has specific business needs, it is sensible for them to abstain from searching for a one-size-fits-all faultless software application. Needless to say, it would be pointless to try to find such a platform even among popular software applications. The intelligent thing to do would be to catalog the various essential elements that require consideration such as required features, budget, skill levels of workers, company size etc. Then, you should do your groundwork thoroughly. Read some Rubberstamp.io reviews and investigate each of the other apps in your shortlist in detail. Such in-depth research can make sure you reject ill-fitting platforms and zero in on the system that presents all the aspects you need for business success. How Much Does Rubberstamp.io Cost? After 50 users, the vendor can add extra users at $13.50 per user/month. We realize that when you make a decision to buy Accounting Software it’s important not only to see how experts evaluate it in their reviews, but also to find out if the real people and companies that buy it are actually satisfied with the product. That’s why we’ve created our behavior-based Customer Satisfaction Algorithm™ that gathers customer reviews, comments and Rubberstamp.io reviews across a wide range of social media sites. The data is then presented in an easy to digest form showing how many people had positive and negative experience with Rubberstamp.io. With that information at hand you should be equipped to make an informed buying decision that you won’t regret. What are Rubberstamp.io pricing details? What integrations are available for Rubberstamp.io? Rubberstamp.io offers an API for integrations. It also integrates with Xero and Google Authentication Appliance. You also can export your data as .csv at any time, which is compatible with your accounting software. If you need more information about Rubberstamp.io or you simply have a question let us know what you need and we’ll forward your request directly to the vendor.